Cave bears have lived several ice ages, and for tens of thousands of years they have virtually no serious enemies. With a weight of about five meters (at the extreme but up to one tonne) and a body length of 3.5 meters, they were really uncompetitive. Still, their track of history about 24,000 years ago is beginning to disappear. Why did they actually die? This was decided by the paleobiologists at the University of Tübingen. An international team of experts from Canada, Italy and Germany focused on exploring the museum exhibits and preserved skeletal remains of these truly massive bears. Hypotheses to clarify the caving of the cave bear were available several times. Climate change, a constant competitive struggle with younger and younger brown bears, and, of course, the pressure of our human ancestors came into being. But none of these variants seemed to be real. The cave bears had already had several successive surviving ice stages, and the human population was so small at that time that it could not yet cause the extinction of an animal species. And bear competition? 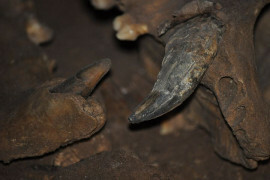 As DNA analyzes, as well as numerous analyzes of carbon and nitrogen isotopes in the collagen of skeletal fragments, with brown bears, the caves did not catch the food. They were heavily focused on plant food. Both species are classified as omnivores, but in the case of cave bears, it was a practical herbivore, intertwined only here and there by some small rodent or cannibalisation of their own offspring. The Cave Bears gradually evolved with each subsequent ice stage to receive nutritious plant foods. However, the successful strategy of undemanding grazing of berries and juicy leaves is relatively early, it has gotten into the narrow. Cooling has come. As the paleobiologist Hervé Bocherens writes, "The Cave Bear, which first appeared 400,000 years ago as a scimitar with a slight weakness for vegetables, has grown into a nutrition specialist, vegan, by 24,000." And with the onset of the last glacial maxim, the misery of herbal diet was inadequate. With the subsequent decline of ice this time the bear does not come out of the cave stronger, but rather disturbed and evolution condemned to extinction. The time has changed and the herbivorous cave bear is no longer able to adapt to other changes, like a more successful omnivore, the brown bear. Changing climatic conditions, which affected the cave bear's food resources, also combined with our population change: Neanderthals were slowly pushed out by "anatomically modern humans" 50,000 years ago. Locally, cave bears survived for some time in the isolated alpine mountains where hunters did not get behind, and in part of Romania. "Despite the cold climate, they did not consume meat in these areas, and therefore were unable to stop these difficult conditions," says Bocherens. "The cause of the extinction of the cave bears is not the only one: it was a combination of evolutionary and climatic factors that eventually accelerated the expansion of the human population." It is essential for COPD to keep your lungs in shape! Tickets, tickets, tickets - how to shop online?